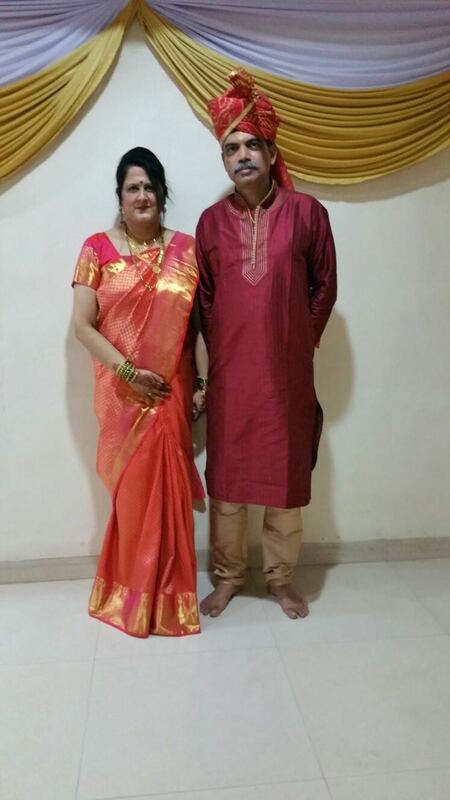 Sorry folks, especially Swapna, for this late post on Gayatri’s wedding saris. This is in continuation of the Sangeet Sari post a couple of days back. For Gayatri’s wedding, I had taken along a gorgeous Benarasi silk. Since April 2nd was also the World Autism day and Jaishree from our W3-Women Weave World group inspired us to do a virtual sari date and wear blue that day, it was a Banarasi blue. 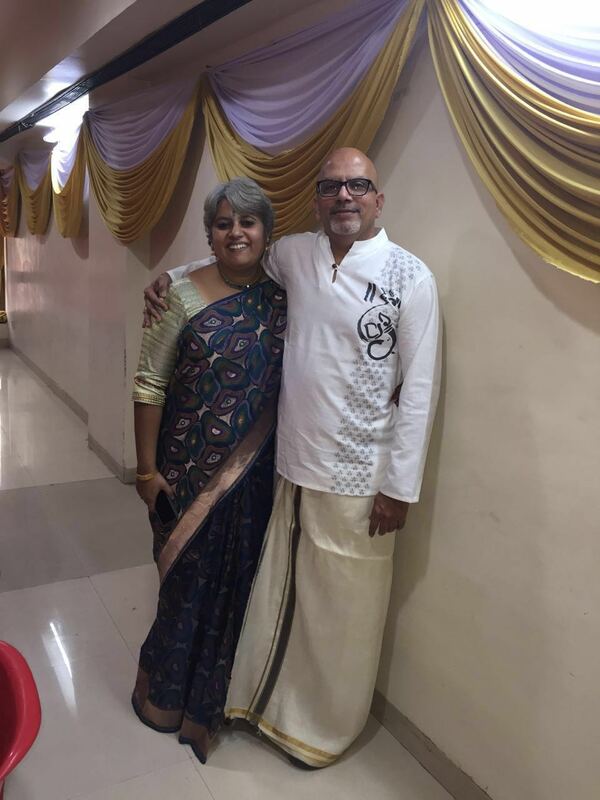 🙂 I also realised that I have only two saris that are really wedding type saris with heavy “zari” work – one is this Benarasi and the other is my wedding reception Kanchivaram silk sari. So need to buy a few more of the wedding type saris. Krishnan is wearing the silk “Veshti” from our wedding, and with a belt so it doesn’t slip off :). Its so difficult to get him to wear anything festive, he is happy to wear shorts and a t-shirt to most occasions or he will happily swing to the other extreme of wearing a suit. Since Pune was so hot, he decided against the suit, while we did carry a dinner jacket, it was really warm to even think of wearing it. I bought this Benarasi silk from Valkalam saris, Benaras. The blouse belongs to another Benarasi sari 🙂 and the neckpiece is a gift from my uncle to mom some 40 years back and is made of very classy glass beads. I don’t like gold jewellery much except my nose pin and my earrings. These glass beads match perfectly because they are a mix of green and blue. Don’t miss the “jimiki” (ear rings that are like an inverted umbrella. 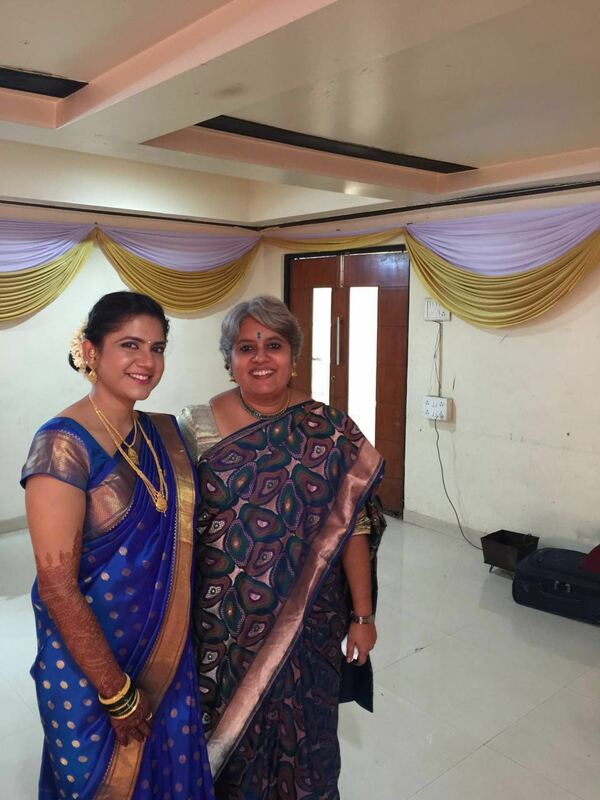 The bride Gayatri wore this awesome blue Paithani and she looks so lovely. Please shower this beautiful girl with all your blessings for a great married life. My friend Geetu wore one of the most beautiful saris on this day. Its not just that I am super biased towards her and love her dressing sense, but its really a beautiful sari. See for yourselves. Its Kanchivaram brocade. I mistook it for a Benarasi. Bride’s parents. Doesn’t she look awesome ? And the sari has me swooning over it. :):) Harish, don’t mean to ignore you, you look great, but Geetu just stole the show and yes, I am biased towards my friend. Next set of saris in the next post.